A few racks of baby back ribs with Reverend Marvin’s Gourmet BBQ Sauce, along with Sweet Baby Ray’s and KC Masterpiece get cooked, smoked, eaten and rated. Sweet Baby Ray’s (upper right) was very good. And predictable. Sweet, vinegary. Comforting. Up until now, this was Wifey’s favorite sweet BBQ sauce. KC Masterpiece (lower right) was 5 parts KC, 1 part honey. Sweet, smoky, very authentic tasting. As much as Wifey and I like Sweet Baby Ray’s, we thought the KC Masterpiece was a more authentic sticky BBQ sauce. But the star of this show was the Reverend Marvin’s Gourmet BBQ Sauce ( upper left in above pic). A mustard based sauce, with no sugar/sweetener to speak of, so you can slather this on early, middle and late in your cook. It also does not mask the flavor of the pork, so the rub and pork come out underneath the mustard flavor of Reverend Marvin’s. Started in the 1960’s, Marvin Lynch perfected his mustard based BBQ sauce to the rave reviews of his family, friends and congregations. Today, his son Woody Lynch continues this great BBQ sauce company. A fine example of a company doing one thing, and doing it right! They only have 2 products – Reverend Marvin’s Gourmet BBQ Sauce Original, and Hot. We tried both, and I’m partial to the Original. As a chilehead, I usually don’t care for too much heat in my BBQ sauces. Having said that, the Hot version is spicy, yet tame. Try both and see what you think. Back in time, a month or so, the first thing I did with the Rev. Marvin’s was BBQ some chicken on the grill. I remember thinking “this is very unique tasting. Can’t wait to try it on ribs!” Sadly, I have no pics of the chicken. But check out the bark on the ribs with the Reverend Marvin’s sauce on them. 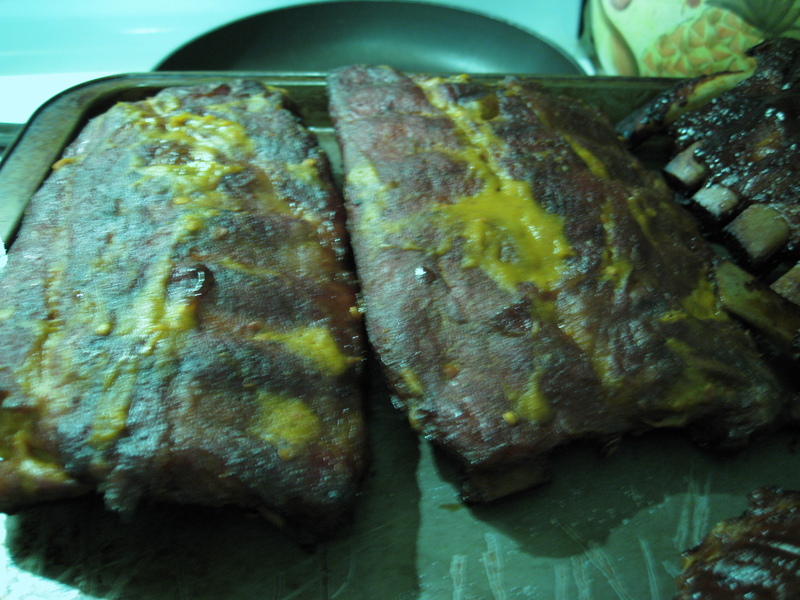 And I love being able to baste more sauce on the ribs as they cook. Without the sugar, there is no burning. Mustard (vinegar, mustard seed, turmeric), Distilled Vinegar, Ketchup, Lemon Juice, Worcestershire (hfcs, molasses, salt, vinegar, soy protein, anchovies), Salt, Spices and Xantham Gum. You do a great job reviewing sauce for us consumers! You are very thorough and you don’t pull punches! Great job on this particular contest…I do love me some Reverend Marvin’s BBQ Sauce! Thanks, Greg! I plan on a full-blown review on the Reverend Marvin’s on wings, chix, and ribs in the future. Reverend Marvins is a staple and very universal sauce in our home! Alone it is delicious on all meats. Kick it up a notch and mix with equal parts of honey it it fantastic on chicken wings, ribs, pork chops and as a dipping sauce. Combine into your favorite meat loaf recipe for an out of this world meat loaf with a little Southern Twang! We order Reverend Marvins Original and Spicy by the case……yes it’s that good! Hooray grilling season is BACK! Thanks for the sauce recs, I’ll look out for that one! Heidi / Savory Tvs last blog post..Top Chef Stephanie Izard’s Mac and Cheese with Apples and Bacon! One of my favs is Rev. Marvs on a ham sandwich or wrap! Thanks for the review. My family is eliminating high fructose corn syrup from our diets and I’m always looking for a good mustard BBQ sauce. This may be a winner on both fronts. HFCS is one of the first three ingredients in SBR. It’s my fave mainstream BBQ sauce, but it’s off the list now. @Scott – great idea – sandwiches and wraps! @Big Orson – I think you’ll love this sauce, and the price and shipping are very reasonable. 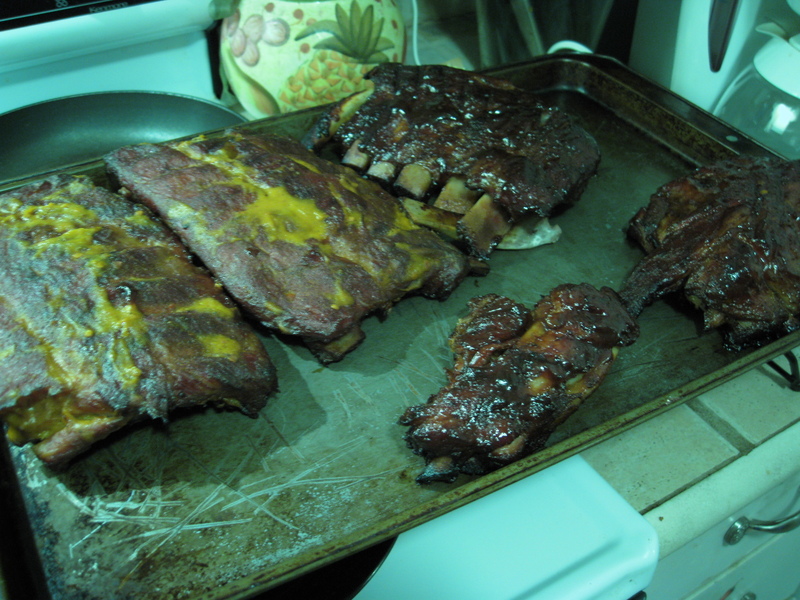 Look for a full-blown recipe/write-up on Reverend Marvin’s coming in May for National Barbecue Month. A mustard based BBQ sauce…I’m going to have to try this. I’m already wanting to try it on chicken and I haven’t even purchased it yet! I found this recipe for Rev. Marvs through Google and it’s awesome! Thanks Brian for a great review and a wonderful recipe! Well, that barbeque sauce looks good. But, I haven’t tried it. I will probably have to get some now! If you’re interested in trying another good BBQ sauce, go to (http://www.pickyvicki.com). They have plenty of flavors to choose from and since 1999 they have been one of the best in the business! Check them out.